Map showing the operating areas (purple polygons) and ports (yellow stars) for expeditions aboard NOAA Ship Okeanos Explorer that will be conducted in Fiscal Year 2019. A total of 9 expeditions, for a combined 173 days-at-sea, will be conducted between October 2018 and September 2019. Included are one expedition focused on sea trials and shakedown operations in the Gulf of Mexico and eight expeditions focused on mapping and exploring deep-sea habitats in the North Atlantic Ocean and the Caribbean Sea. Image courtesy of NOAA Office of Ocean Exploration and Research. Download larger version (jpg, 3.2 MB). 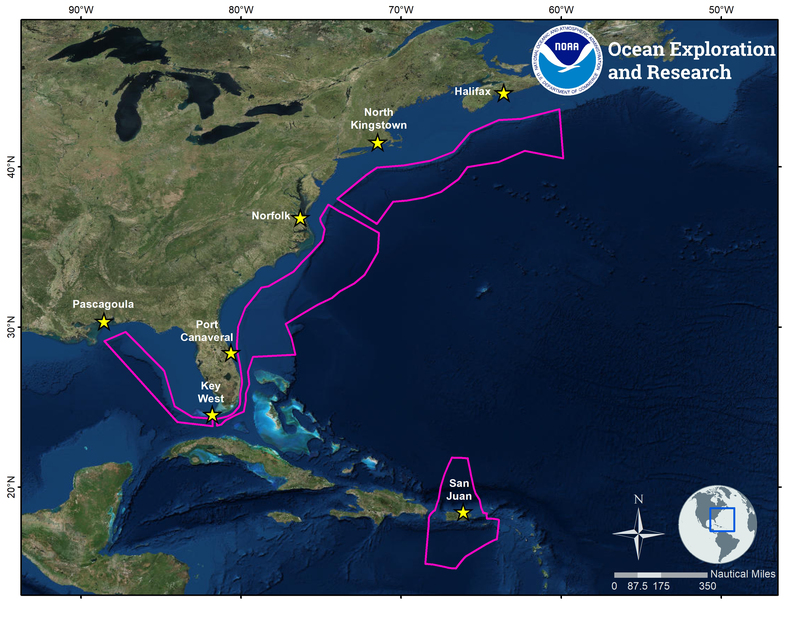 From October 2018 to September 2019, the NOAA Office of Ocean Exploration and Research will lead nine expeditions on NOAA Ship Okeanos Explorer, for a combined 173 days-at-sea, including one expedition focused on sea trails and shakedown operations in the Gulf of Mexico and five expeditions focused on exploring deepwater areas in the North Atlantic Ocean and Caribbean Sea. Multidisciplinary teams of scientists, technicians, and engineers will conduct undersea mapping and remotely operated vehicle (ROV) explorations of the geological, biological, oceanographic, and archaeological resources of these ocean areas, the majority of which remain largely unexplored. 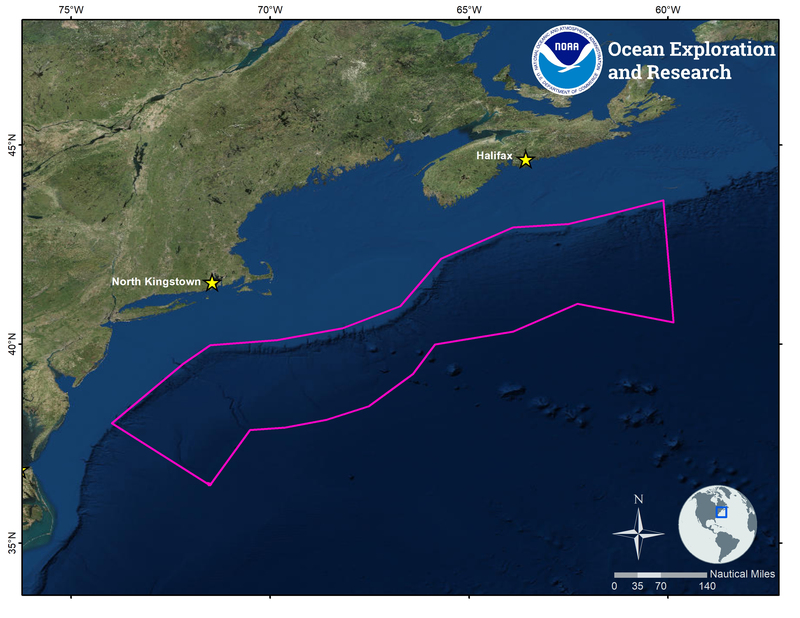 Over the course of these expeditions, science teams will focus on exploring poorly known deep-sea areas off the Atlantic Continental Margin of the U.S. and Canada. These expeditions will be part of the Atlantic Seafloor Partnership for Integrated Research and Exploration (ASPIRE) campaign, a major multi-year, multi-national collaborative field program focused on increasing our collective knowledge of the North Atlantic Ocean in support of the Galway Statement on Atlantic Ocean Cooperation , an initiative between the United States, Canada, and the European Union to advance knowledge of the Atlantic leading to improved ocean stewardship and understanding. NOAA is proud to be partnering with Canada and the European Union to conduct work in support of the Galway Statement. Field operations will target largely unknown or poorly understood areas and will be designed to build on previous work in order to help fill knowledge gaps. In addition to expeditions focused on mapping and ROV operations, 2019 operations will also include one expedition dedicated to technology demonstrations. This expedition will test novel approaches or emerging technologies for ocean science and exploration, thereby strengthening the capabilities of NOAA Ship Okeanos Explorer as a platform for technology advancement and testing. Throughout the year, telepresence technology will allow you to follow discoveries via the NOAA Office of Ocean Exploration and Research website, putting the unexplored ocean directly into your hands. NOAA is currently seeking scientists and managers interested in actively participating during 2019 expeditions. For details on opportunities to get involved, please visit this page. If you are interested in providing input into expedition planning or participating as a scientist or student, please contact the Expeditions Science Advisor, Dr. Scott France, at france@louisiana.edu. 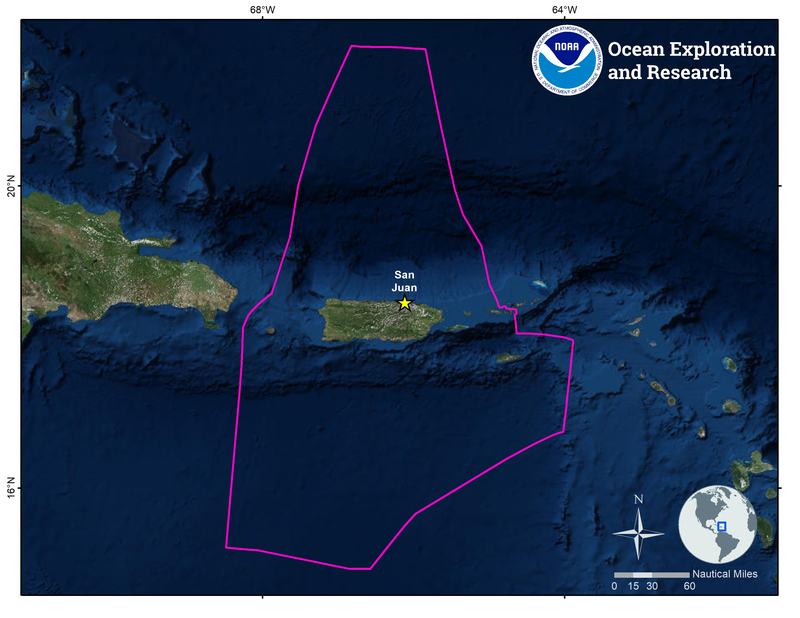 Map showing the operating area (purple polygon) and port (yellow stars) for the 2018 NOAA Ship Okeanos Explorer expedition focused on mapping and ROV operations in the U.S. Caribbean Sea. Image courtesy of the NOAA Office of Ocean Exploration and Research. Download larger version (jpg, 2.6 MB). In October through November 2018, NOAA Ship Okeanos Explorer will embark on a 22-day expedition to collect critical baseline information about unknown and poorly understood deepwater areas surrounding Puerto Rico and the U.S. Virgin Islands. The deep waters of Puerto Rico and the U.S. Virgin Islands contain a wide diversity of habitats and geological features, including seamounts, submarine canyons, valleys, troughs, and trenches, the vast majority of which have never been explored. The expedition will include daytime ROV dives, overnight mapping operations, as well as continuous shore-side participation via telepresence technology. ROV dives will focus on exploring deep-sea coral and fish habitats, midwater habitats, submarine canyons, seamounts, trenches, and other unique geological features. Mapping operations will focus on seafloor and water column areas with little or no high-quality sonar data, as well as to support ROV operations and identify potential maritime heritage sites. October 30 - November 20, 2018: Mapping and remotely operated vehicle operations starting and ending in San Juan, Puerto Rico. 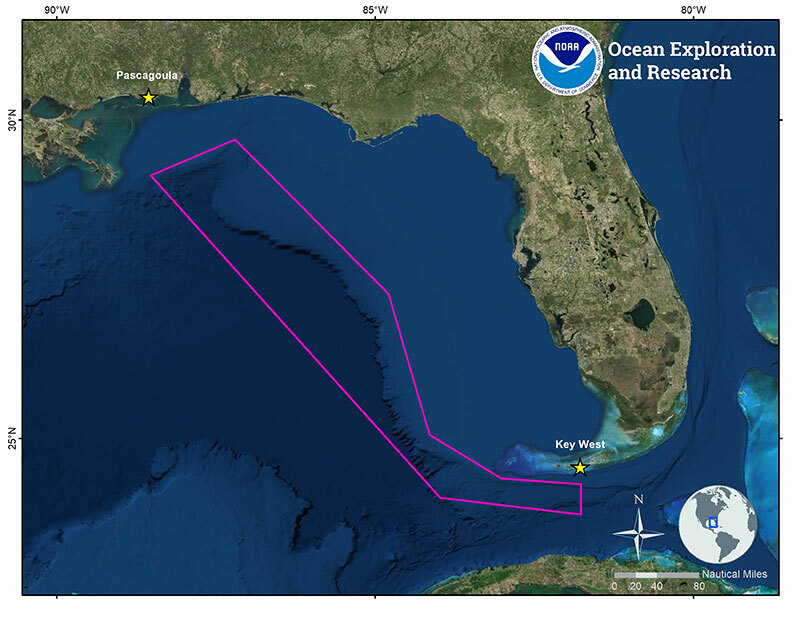 Map showing the operating area (purple polygon) and ports (yellow stars) for the 2019 NOAA Ship Okeanos Explorer expedition focused on sea trials and shakedown operations in the Gulf of Mexico. Image courtesy of the NOAA Office of Ocean Exploration and Research. Download larger version (jpg, 2.7 MB). In May 2019, a 13-day expedition on NOAA Ship Okeanos Explorer will focus sea trials and shakedown operations to prepare the ship’s scientific systems for the remainder of 2019 expeditions. Shakedown operations will include calibrating the EM302 multibeam sonar and the EK60/EK80 split-beam sonars used for mapping operations, as well as the ultra short baseline (USBL) sonar used for positioning during ROV operations. Several ROV test dives will be completed, including tests of a new suction sampling device. A new sonar syncing device will also be tested, and work will be completed to get the ship’s underway CTD system operational. May 12 - May 24, 2019: Sea trials and shakedown operations starting in Pascagoula, Mississippi, and ending in Key West, Florida. Map showing the operating area (purple polygon) and ports (yellow stars) for the 2019 NOAA Ship Okeanos Explorer expeditions focused on mapping and exploration of the U.S. southeastern continental margin and Bahamas. Image courtesy of the NOAA Office of Ocean Exploration and Research. Download larger version (jpg, 2.8 MB). From October 2018 through July 2019, four expeditions conducted on NOAA Ship Okeanos Explorer, for a combined 82 days-at-sea, will focus on mapping and exploring deep waters off the U.S. southeastern continental margin, the Blake Plateau, and the Bahamas. 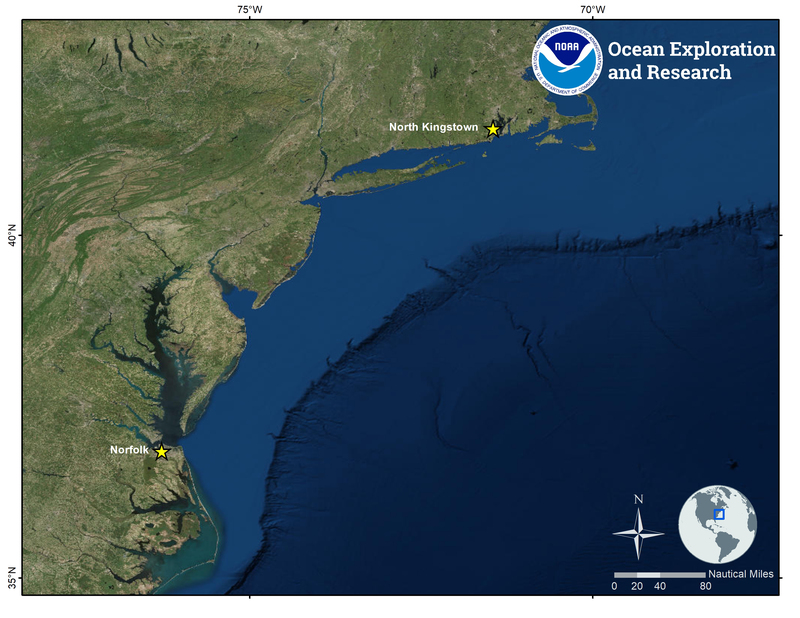 This region has extensive yet poorly explored deep-sea coral habitats, chemosynthetic communities, as well as important maritime heritage resources, all of which are of high interest to federal agencies with research and management responsibilities. At-sea operations will include collecting mapping data and exploring deep-sea coral and sponge habitats, submerged cultural resources, gas seeps, chemosynthetic communities, and submarine canyons. Mapping will also be completed in Bahamian waters in support of the U.S. Extended Continental Shelf Project (ECS) mapping effort, as well as to conduct sonar characterization of the ship’s EM302 multibeam system in the Naval Atlantic Undersea Test and Evaluation Center, in partnership with the University of New Hampshire’s Center for Coastal and Ocean Mapping. October 2 - 24, 2018: Mapping operations starting in North Kingstown, Rhode Island, and ending in San Juan, Puerto Rico. Sonar acceptance tests and ECS mapping. November 28 - December 16, 2018: Mapping operations starting in San Juan, Puerto Rico, and ending in Charleston, South Carolina. May 29 - June 14, 2019: Mapping operations starting in Key West, Florida, and ending in Port Canaveral, Florida. June 20 - July 12, 2019: Mapping and ROV operations starting in Port Canaveral, Florida, and ending in Norfolk, Virginia. 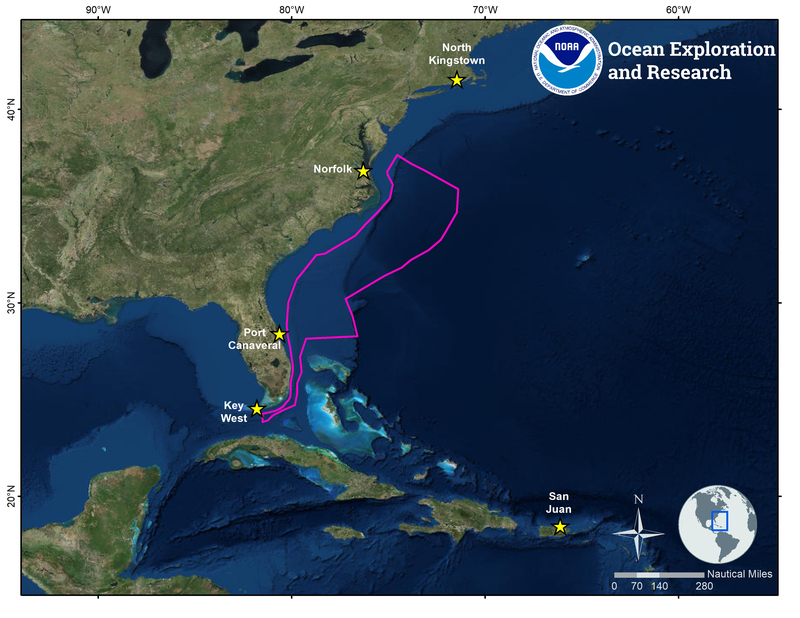 Map showing the operating area (purple polygon) and ports (yellow stars) for 2019 NOAA Ship Okeanos Explorer expeditions focused on mapping and exploration off the northeast United States and Canada. Image courtesy of the NOAA Office of Ocean Exploration and Research. Download larger version (jpg, 2.6 MB). From August through September 2019, two expeditions on NOAA Ship Okeanos Explorer, for a combined 36 days-at-sea, will include ROV and mapping operations along the Atlantic continental margin off New England and the southeast coast of Canada. This region contains numerous submarine canyons and seamounts, ecosystems that are of great interest to resource managers and scientists because they harbor sensitive marine habitats and a variety of ecologically, commercially, and recreationally important species. Besides harboring rich and diverse fauna, the steep walls of submarine canyons of this region are also prone to landslides and can reveal old rock layers that are of interest to geologists. In addition to supporting science and management priorities of this region, these expeditions will also address other ASPIRE priorities, such as leveraging international partnerships to conduct coordinated exploration across the North Atlantic Ocean. Expedition activities will complement previous and upcoming work in the region, and mapping operations will concentrate on seafloor and water column areas with little or no high-quality sonar data, as well as to support ROV operations. August 6 -August 20, 2019: Mapping operations starting in North Kingstown, Rhode Island, and ending in Halifax, Nova Scotia. August 26 - September 15, 2019: Mapping and ROV operations starting in Halifax, Nova Scotia, and ending in North Kingstown, Rhode Island. Map showing the general operating area and ports (yellow stars) of the 2019 technology demonstration expedition aboard NOAA Ship Okeanos Explorer. The specific technologies and operating area for the expedition have not been finalized, but will be announced via the NOAA Office of Ocean Exploration website once plans are refined. Image courtesy of the NOAA Office of Ocean Exploration and Research. Download larger version (jpg, 2.8 MB). In July through August 2019, a 15-day expedition on NOAA Ship Okeanos Explorer will focus on field testing emerging technologies in order to facilitate the advancement of technologies that further ocean exploration. The specific technologies that will be tested on this expedition have not yet been finalized, but will be announced via the NOAA Office of Ocean Exploration and Research website once plans are refined. July 18 - August 1, 2019: Emerging technology demonstrations starting in Norfolk, Virginia, and ending in North Kingstown, Rhode Island.